Susan Neal Moore posted: I have them. Love them. The usb powers off when not in use. Connie Charnas Harget posted: Wow! We have an iPad and 2 iPod touches, always trying to share the power cord. Hmmmm, where to install that is now the question. I think I will snag one with my Swagbucks rewards! Sue Schoch Pauch posted: I think that's a good idea with all the electronics out today. Merry Blakely Graham posted: Amazing idea!!! 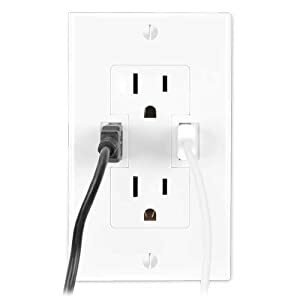 We have only 2 outlets in one room and this would so help! Bubba Sanders posted: Awesome. Just need longer cables. George Burgan posted: Good idea, if you don't have a computer. Waste of money if you do. Most computer towers are loaded with usb ports..
Katie Perusse posted: My new house rule..... at least 2 in each room.. I think it's a great idea, because having a PC doesn't mean you have space to put the items you are charging. There are many times we have to charge phones & cameras, and these would be wonderful!